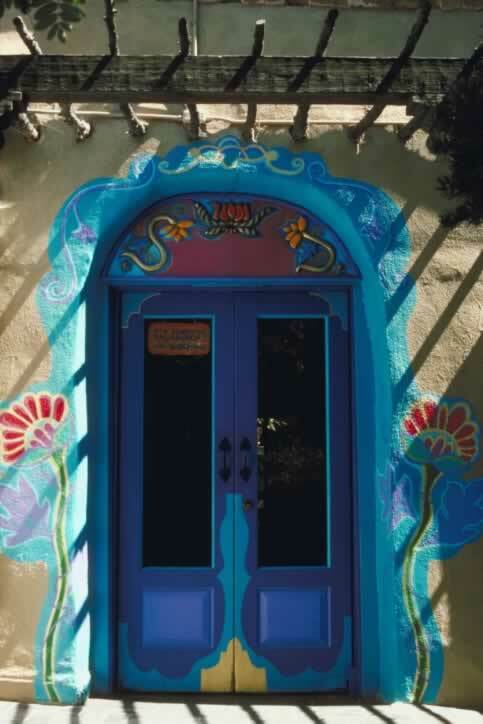 This store will not be easily missed, thanks to the hand painted detailing surrounding the adobe archway. Two large colorful flowers against a background of blue flank these double doors. Above the arch, scrollwork in yellow, purple, and blue drapes the arch. Beneath the arch, a semi-circular panel with carved, wooden flowers have been painted similar colors. These doors are framed with two panels. Each door has a very large lite (the term for a pane of glass in a door) and beneath it, one raised panel. Though some people mistakenly refer to double doors such as these as French doors, true French doors have a lite or joined lites running the entire length of the door. The doors' frame is painted purple, with some detailing in blue. The raised bottom panels are painted a different shade of purple.